Even with proper dental care, a tooth may become chipped without warning. Injury or the foods we eat can lead to chipped teeth. If you've already experienced a chipped tooth, Dr. Michael Bixby offers a variety of restorative dentistry treatments to repair your smile. To find out which treatments are right for you, we welcome you to schedule a consultation at Dr. Bixby's Red Bank practice. In the meantime, you can help protect your teeth by understanding the causes of chipped teeth. Facial injury: Facial injuries, whether from a car accident, falling, or sporting accident, can lead to dental damage, including chipped teeth. Using your teeth as tools: Using your teeth as tools, like using them to open plastic packages, can result in chipped teeth and other dental damage. Chewing on hard items: Biting down or chewing on hard items like plastic or metal pen caps or fingernails, can damage the teeth, causing chips or fractures. Temperature fluctuations: Our teeth are regularly exposed to temperature fluctuations when we eat. Extreme temperature fluctuations, like eating hot food and then drinking something ice cold, can actually create fractures in our teeth over time, which can lead to chips. Eating hard foods: Biting hard foods, like hard candies, corn chips, or corn nuts, may chip a tooth, especially if other dental issues have weakened the teeth. You can prevent chipped teeth by avoiding the causes. Wearing a mouth guard while playing sports can protect the teeth from sports-related injury. If you have a habit of using your teeth to open packages or you regularly chew on pen caps, avoid doing so to reduce the risk of chipped teeth. Porcelain veneers: Porcelain veneers are tooth-shaped fabrications used to mask flaws, including dental chips. Each veneer is customized for a great fit and match with the surrounding teeth. Dental bonding: Dental bonding may also be used to mask dental flaws and repair chipped teeth. Dental bonding uses a tooth-colored resin, which is shaped directly on the tooth to address chips and other imperfections. Dental crowns: Dental crowns completely surround a damaged tooth and may be used when damage is too severe for veneers or dental bonding treatment. 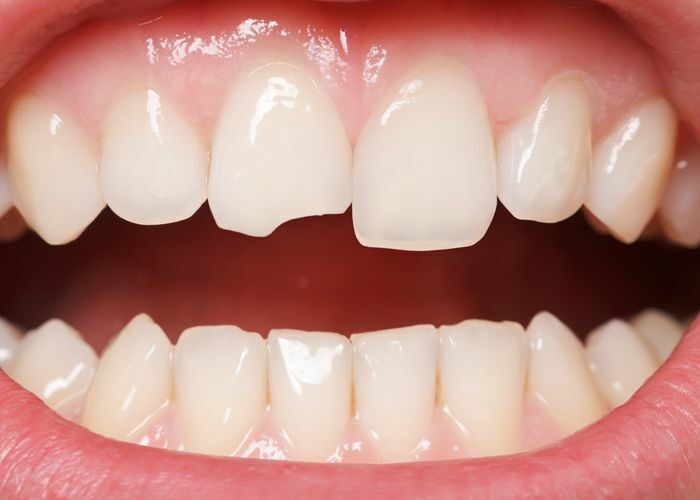 Chipped teeth can be a source of self-consciousness and pose a major risk to dental health. If you have a chipped tooth, it's important to seek treatment as soon as possible. Schedule a consultation with Dr. Bixby to discuss your specific treatment options.